David and his son "Brian"
Our Founder, Father, Grandfather and Great-Grandfather. 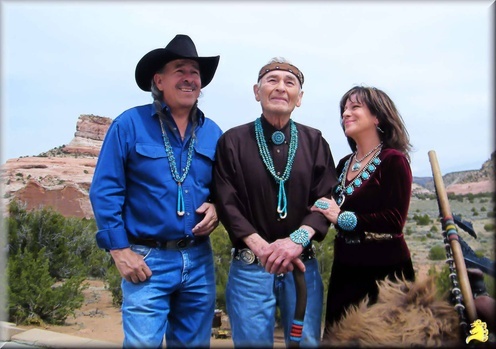 Frank started selling at a very young age at his parents rug stand on The Navajo Reservation, located at the Arizona and New Mexico State line at old route 66. He sold Navajo hand-woven rugs and petrified wood to the passing travelers. In those days he remembers the small single lane highway that ran in front of the stand, that gave him the opportunity to meet and talk with many people from all parts of the country and the World. 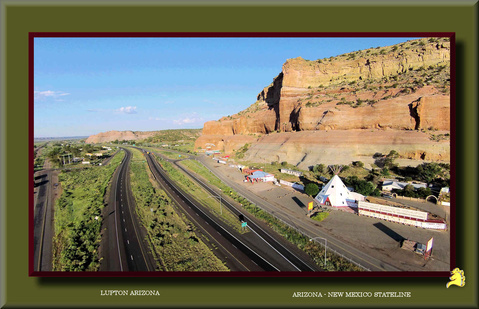 Today, Frank's trading post is located in Lupton Arizona, nested in a valley between beautiful carved sandstone cliff. He still enjoys the interesting conversations with the travelers. In our site, you will find that we specialize in David Yellowhorse Knives and his Jewely. You will find some of David's work in the products section to the left. We have many limited editions of Knife art and jewelry by Yellowhorse.